If you don't have Adobe Reader to enable you to view the booklet, please click on the link below to download a free copy. When your enquiry is received, you will either be invited to ring to make an appointment to view if puppies of your chosen colour/gender are available now, or we will let you know when they're likely to be available and ask if you wish to be placed on the waiting list. We will then contact you again when a suitable litter is a week or so old, giving you details of the sire and dam (including pedigrees, health test results, etc), and asking whether you would like to be contacted when the puppies are ready for viewing, which is normally around 4/5 weeks of age. The puppies are then ready for collection at 8 weeks. If you would like to see some typical litters, please visit our Videos page, or view a slideshow here. 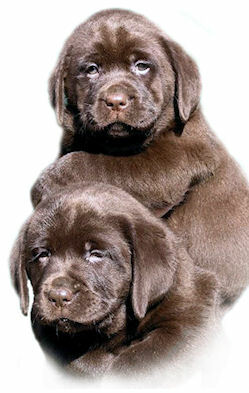 We have been established breeders of black, yellow and chocolate Labradors for over 50 years. Puppies are frequently available, all bred from health tested parents not only of superb quality from long-established proven bloodlines, but also with wonderful temperaments - a factor on which we place great importance. If you would like to enquire about current or future availability, please complete an ENQUIRY FORM and we'll get back to you promptly. 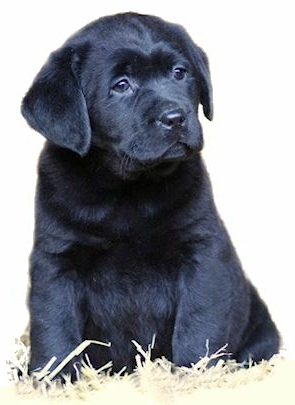 If we may, we'd like to start by checking that you've carefully considered the huge responsibility and long-term commitment of buying a Labrador puppy, which is going to mature into a large, strong dog requiring plenty of daily exercise! Homes where the puppy is to be left alone all day are unsuitable, as it will require company, affection, house-training and exercise. It will be necessary to have a fully-fenced, private garden and, whilst Labradors are generally wonderful with small children, puppies obviously should not be regarded as their toys or allowed to be teased. Lecture over! If you have any queries arising from the booklet that you would like answering prior to visiting, please e-mail us and we'll be happy to advise. And finally ... please remember that we're always here to offer advice and support throughout your dog's life. 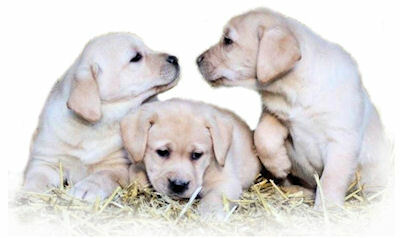 When you come to choose a puppy, you will be given a copy of our booklet 'Feeding, Training and Care of your Labrador Puppy'. If you would like to download a copy so that you can prepare any questions you may have before your visit (or if you have already had one and it has simply been lost/eaten!) please click the icon below to download a further copy. Assuming that you've taken all that into account, let's tell you about our puppies! All our puppies are bred from health tested parents not only of superb quality from long-established proven bloodlines, but also with wonderful temperaments - a factor on which we place great importance. 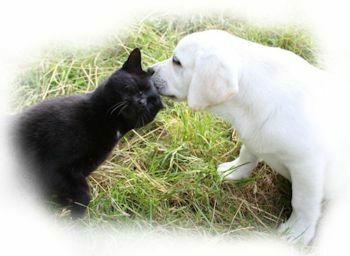 The rural environment in which the puppies are reared (we are based on a farm and also keep horses) affords them the advantage of an early introduction to other animals. All our dogs are kept in impeccable conditions, which are regularly inspected by the local council's Environmental Health Officer and a senior veterinary surgeon. Our Licence holds the top-rated award of 5 stars and is on display for anyone wishing to see it when they visit to view a litter. We take advantage of all relevant KC/BVA schemes and all our puppies have a health check here by our vet before they go to new homes. Whilst the majority of our puppies are bought as companions, their intelligence and adaptabiliy has enabled many of them to enjoy successful careers, not only in their 'natural' role as gundogs, but also as guide dogs for the blind, hearing dogs for deaf people, sniffer dogs, dogs for the disabled, and - in one case - champion truffle hunter of France!